This example shows how to use Robust Control Toolbox™ to design a robust controller for an active suspension system. Conventional passive suspensions use a spring and damper between the car body and wheel assembly. The spring-damper characteristics are selected to emphasize one of several conflicting objectives such as passenger comfort, road handling, and suspension deflection. Active suspensions allow the designer to balance these objectives using a feedback-controller hydraulic actuator between the chassis and wheel assembly. 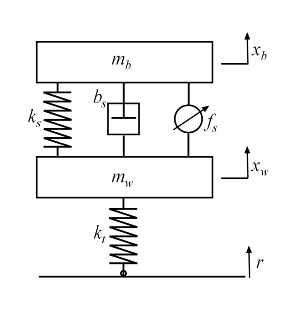 This example uses a quarter-car model of the active suspension system (see Figure 1). The mass mb (in kilograms) represents the car chassis (body) and the mass mw (in kilograms) represents the wheel assembly. The spring ks and damper bs represent the passive spring and shock absorber placed between the car body and the wheel assembly. The spring kt models the compressibility of the pneumatic tire. The variables xb, xw, and r (all in meters) are the body travel, wheel travel, and road disturbance, respectively. The force fs (in kiloNewtons) applied between the body and wheel assembly is controlled by feedback and represents the active component of the suspension system. Construct a state-space model qcar representing these equations. 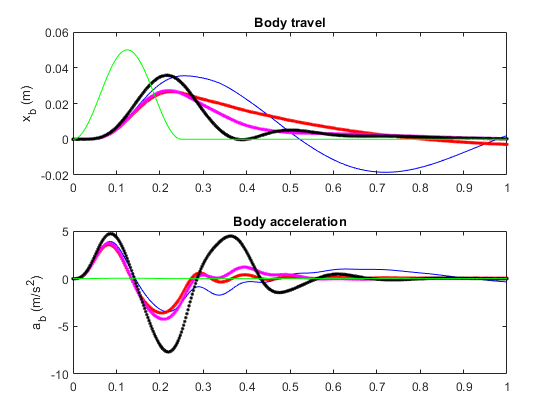 The transfer function from actuator to body travel and acceleration has an imaginary-axis zero with natural frequency 56.27 rad/s. This is called the tire-hop frequency. Similarly, the transfer function from actuator to suspension deflection has an imaginary-axis zero with natural frequency 22.97 rad/s. This is called the rattlespace frequency. Road disturbances influence the motion of the car and suspension. Passenger comfort is associated with small body acceleration. The allowable suspension travel is constrained by limits on the actuator displacement. 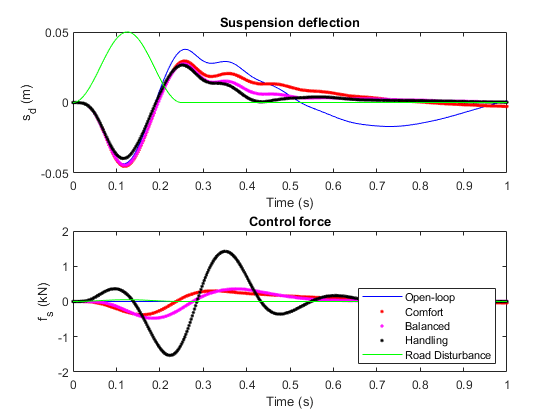 Plot the open-loop gain from road disturbance and actuator force to body acceleration and suspension displacement. 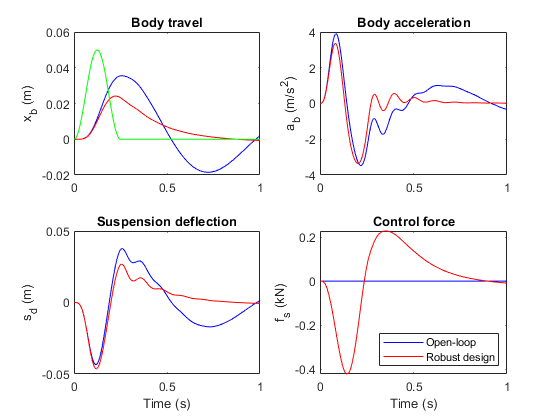 Because of the imaginary-axis zeros, feedback control cannot improve the response from road disturbance r to body acceleration ab at the tire-hop frequency, and from r to suspension deflection sd at the rattlespace frequency. 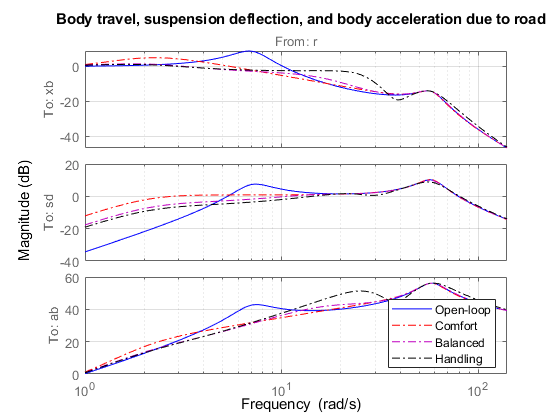 Moreover, because of the relationship xw=xb-sd and the fact that the wheel position xw roughly follows r at low frequency (less than 5 rad/s), there is an inherent trade-off between passenger comfort and suspension deflection: any reduction of body travel at low frequency will result in an increase of suspension deflection. The hydraulic actuator used for active suspension control is connected between the body mass mb and the wheel assembly mass mw. 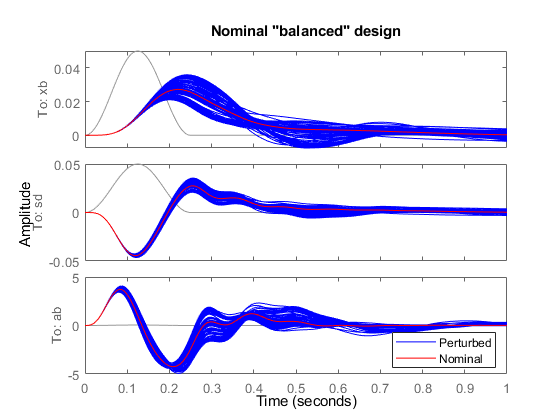 The nominal actuator dynamics are represented by the first-order transfer function 1/(1+s/60) with a maximum displacement of 0.05 m.
This nominal model only approximates the physical actuator dynamics. We can use a family of actuator models to account for modeling errors and variability in the actuator and quarter-car models. This family consists of a nominal model with a frequency-dependent amount of uncertainty. 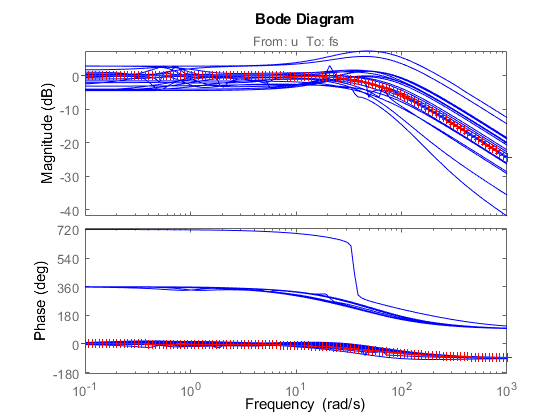 At low frequency, below 3 rad/s, the model can vary up to 40% from its nominal value. Around 3 rad/s, the percentage variation starts to increase. The uncertainty crosses 100% at 15 rad/s and reaches 2000% at approximately 1000 rad/s. The weighting function Wunc is used to modulate the amount of uncertainty with frequency. The result Act is an uncertain state-space model of the actuator. Plot the Bode response of 20 sample values of Act and compare with the nominal value. The main control objectives are formulated in terms of passenger comfort and road handling, which relate to body acceleration ab and suspension travel sd. Other factors that influence the control design include the characteristics of the road disturbance, the quality of the sensor measurements for feedback, and the limits on the available control force. To use H∞ synthesis algorithms, we must express these objectives as a single cost function to be minimized. This can be done as indicated Figure 2. Figure 2: Disturbance rejection formulation. Sensor noise on both measurements, modeled as normalized signals d2 and d3 shaped by weighting functions Wd2 and Wd3. We use Wd2=0.01 and Wd3=0.5 to model broadband sensor noise of intensity 0.01 and 0.5, respectively. In a more realistic design, these weights would be frequency dependent to model the noise spectrum of the displacement and acceleration sensors. The control objectives can be reinterpreted as a disturbance rejection goal: Minimize the impact of the disturbances d1,d2,d3 on a weighted combination of control effort u, suspension travel sd, and body acceleration ab. 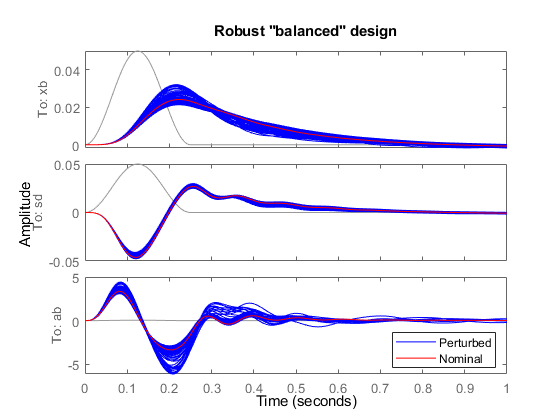 When using the H∞ norm (peak gain) to measure "impact", this amounts to designing a controller that minimizes the H∞ norm from disturbance inputs d1,d2,d3 to error signals e1,e2,e3. Create the weighting functions of Figure 2 and label their I/O channels to facilitate interconnection. Use a high-pass filter for Wact to penalize high-frequency content of the control signal and thus limit the control bandwidth. Specify closed-loop targets for the gain from road disturbance r to suspension deflection sd (handling) and body acceleration ab (comfort). Because of the actuator uncertainty and imaginary-axis zeros, only seek to attenuate disturbances below 10 rad/s. The corresponding performance weights Wsd,Wab are the reciprocals of these comfort and handling targets. To investigate the trade-off between passenger comfort and road handling, construct three sets of weights (βWsd,(1-β)Wab) corresponding to three different trade-offs: comfort (β=0.01), balanced (β=0.5), and handling (β=0.99). 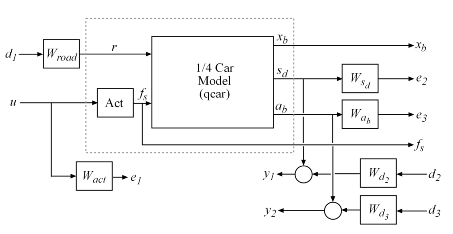 Finally, use connect to construct a model qcaric of the block diagram of Figure 2. Note that qcaric is an array of three models, one for each design point β. Also, qcaric is an uncertain model since it contains the uncertain actuator model Act. 3x1 array of uncertain continuous-time state-space models. Type "qcaric.NominalValue" to see the nominal value, "get(qcaric)" to see all properties, and "qcaric.Uncertainty" to interact with the uncertain elements. Use hinfsyn to compute an H∞ controller for each value of the blending factor β. The three controllers achieve closed-loop H∞ norms of 0.94, 0.67 and 0.89, respectively. Construct the corresponding closed-loop models and compare the gains from road disturbance to xb,sd,ab for the passive and active suspensions. Observe that all three controllers reduce suspension deflection and body acceleration below the rattlespace frequency (23 rad/s). To further evaluate the three designs, perform time-domain simulations using a road disturbance signal r(t) representing a road bump of height 5 cm. Observe that the body acceleration is smallest for the controller emphasizing passenger comfort and largest for the controller emphasizing suspension deflection. The "balanced" design achieves a good compromise between body acceleration and suspension deflection. So far you have designed H∞ controllers that meet the performance objectives for the nominal actuator model. As discussed earlier, this model is only an approximation of the true actuator and you need to make sure that the controller performance is maintained in the face of model errors and uncertainty. This is called robust performance. Next use μ-synthesis to design a controller that achieves robust performance for the entire family of actuator models. The robust controller is synthesized with the dksyn function using the uncertain model qcaric(:,:,2) corresponding to "balanced" performance (β=0.5). 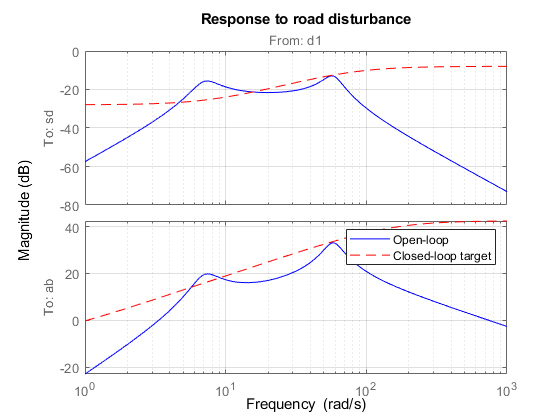 Simulate the nominal response to a road bump with the robust controller Krob. The responses are similar to those obtained with the "balanced" H∞ controller. 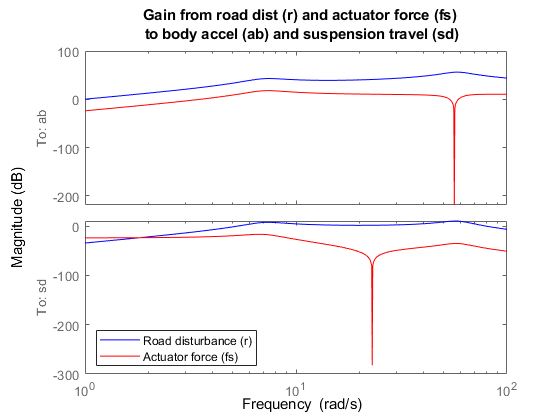 Next simulate the response to a road bump for 100 actuator models randomly selected from the uncertain model set Act. The robust controller Krob reduces variability due to model uncertainty and delivers more consistent performance. The robust controller Krob has eleven states. It is often the case that controllers synthesized with dksyn have high order. You can use the model reduction functions to find a lower-order controller that achieves the same level of robust performance. Use reduce to generate approximations of various orders. Next use robgain to compute the robust performance margin for each reduced-order approximation. The performance goals are met when the closed-loop gain is less than γ=1. The robust performance margin measures how much uncertainty can be sustained without degrading performance (exceeding γ=1). A margin of 1 or more indicates that we can sustain 100% of the specified uncertainty. 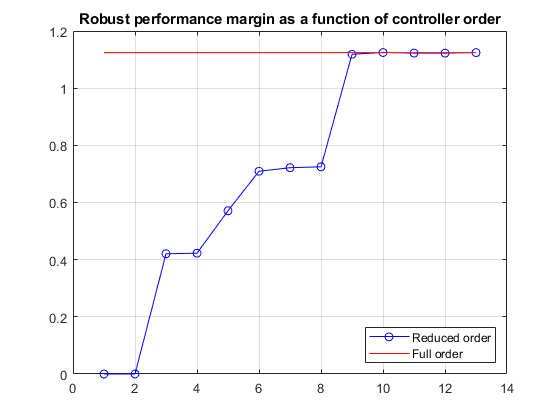 The robust performance margin is well below 1 for controllers of order 7 and lower. However there is no significant difference in performance margin between the 8th- and 11th-order controllers, so you can safely replace Krob by its 8th-order approximation.